1) The Prophet (s) said, "On the Day of Judgment, a caller will call out, 'lower your gaze until Fatima has passed." 2) The Prophet (s) said, "When I long for the fragrance of Paradise I smell the neck of Fatima." Muntakhab Kenz Al-Omal, v. 5, p. 97; Nur Al-Absar, p. 51; Manaqib Al-Imam Ali of Ibn Al-Maghazali, p. 360. 3) The Prophet (s) said, "Of all the women in the Universe, four would suffice: Mary, Asiya, Khadija, and Fatima." Al-Sahihain, v. 3, the Chapter on the Virtues of Fatima, p. 171; Seir Alam Al-Nabala', v. 2, p. 126; Al-Bidaya wa Al-Nihaya, v. 2, p. 59; The Virtues of Al-Imam Ali of Ibn Al-Maghazali, p. 363. 4) The Prophet (s) said, "Oh, Ali, Jibreel has informed me that God has married you to Fatima." Manaqib Al-Imam Ali from Al-Riyadh Al-Nudhra, p. 141. 5) The Prophet (s) said, "I am not pleased unless Fatima is pleased." Manaqib Al-Imam Ali of Ibn Al-Maghazali, p. 342. 6) The Prophet (s) said, "Oh, Ali, God has commanded me to marry you to Fatima." Al-Sawaiq Al-Muhariqa,. ch. 4, p. 142; Dakha'ir Al-Uqubi, p. 30 & 31; Tadhkirat Al-Khawas, p. 276; Manaqib Al-Imam Ali from Al-Riyadh Al-Nudhra, p. 141; Nur Al-Absar, p. 53. 7) The Prophet (s) said, "Verily, God married Ali to Fatima." 8) The Prophet (s) said, "All the children of a mother are attributed to their fatherly relation except the sons of Fatima." Al-Sawaiq Al-Muhariqa, p. 156 & 187; related in similar words in Mustadrak Al-Sahihain, v. 3, p. 179; Kenz All-Omal, v. 13, p. 101; Is^af Al-Raghibeen quoted in the appendix of Nur Al-Absar, p. 144. 9) The Prophet (s) said, "All the children of a woman are attributed to their father, but not the sons of Fatima." Kenz Al-Omal, v. 13, p. 101; Al-Sawaiq Al-Muhariqa, p. 187 & 188; Is^af Al-Raghibeen quoted in the margin of Nur Al-Absar, p. 144. 10) The Prophet (s) said, "The most beloved of my family to me is Fatima." Al-Jami^ al-Sagheer, v. 1, #203, p. 37; Al-Sawaiq Al-Muhariqa, p. 191; Yanabi^ Al-Mawadda, v. 2, ch. 59, p. 479; Kenz Al-Omal, v. 13, p. 93. 11) The Prophet (s) said, "The four greatest women in the Universe are Mary, Asiya, Khadija, and Fatima." Al-Jami^ Al-Sagheer, v. 1, #4112, p. 469; Al-Isaba fi Tamayyuz Al-Sahaba, v. 4, p. 378; Al-Bidaya wa Al-Nihaya, v. 2, p. 60; Dakha'ir Al-Uqubi, p. 44. 12) The Prophet (s) said, "The head of the women of Paradise is Fatima." Kenz Al-Omal, v. 13, p. 94; Sahih Al-Bukhari, Kitab Al-Fadha'il, Chapter on the Virtues of Fatima; Al-Bidaya wa Al-Nihaya, v. 2, p. 61. 13) The Prophet (s) said, "If I were separated from the fruits of Paradise I would kiss Fatima." 14) The Prophet (s) said, "Many men have reached completion, but no women have reached completion except four: Mary, Asiya, Khadija, and Fatima." 15) The Prophet (s) said, "The first people to enter Paradise will be Ali and Fatima." Nur Al-Absar, p. 52; related by similar wording in Kenz Al-Omal, v. 13, p. 95. 16) The Prophet (s) said, "The verse of purification was revealed concerning five people: myself, Ali, Hassan, Hussein, and Fatima." Is^af Al-Raghibeen, p. 116; Sahih Muslim, Kitab Fadha'il Al-Sahaba. 17) The Prophet (s) said, "The best women in Paradise will be Mary, Asiya, Khadija, and Fatima." Seir Alam Al-Nubala', v.2, p. 126; Dakha'ir Al-Uqubi, p. 44. 18) The Prophet (s) said, "The first one to enter Paradise will be Fatima." Yanabi^ Al-Mawadda, v. 2, p. 322, ch. 56. 19) The Prophet (s) said, "The Mehdi is from my family, from the sons of Fatima." 20) The Prophet (s) said, "Verily, God has weaned (fatama in Arabic) my daughter Fatima and her children and those who love them from the Hellfire, and that is why she is named Fatima." Kenz Al-Omal, v. 6, p. 219. 21) The Prophet (s) said, "Fatima, you will be the first amongst my Ahlul-Bayt to follow after me." Haliyat Al-Awliya, v. 2, p. 40; Sahih Al-Bukhari, Kitab Al-Fadha'il; Kenz Al-Omal, v. 13, p. 93; Muntakhab Kenz Al-Omal, v. 5, p. 97. 22) The Prophet (s) said, "Fatima is part of me. Whatever upsets her upsets me, and whatever harms her harms me." Sahih Muslim, v. 5, p. 54; Khasa'is Al-Imam Ali of Nisa'i, p. 121-122; Masabih Al-Sunnah, v. 4, p. 185; Al-Isabah, v. 4, p. 378; Seir Alam Al-Nubala', v. 2, p. 119; Kenz Al-Omal, v. 13, p. 97; similar wording is related in Al-Tirmidhi, v. 3, Chapter on the Virtues of Fatima, p. 241; Haliyat Al-Awliya', v.2, p. 40; Muntakhab Kenz Al-Omal, in the margins of Al-Musnad, v. 5, p. 96; Maarifat Ma Yajib Li Aal Al-Bait Al-Nabawi Min Al-Haqq Alaa Men Adahum, p. 58; Dhakha'ir Al-Uqubi, p. 38; Tadhkirat Al-Khawass, p. 279; Yanabi^ Al-Mawadda, v.2, ch. 59, p. 478. 23) The Prophet (s) said, "Fatima is part of me, and whoever pleases her, pleases me." Al-Sawaiq Al-Muhariqa, p. 180 & 132; Mustadrak Al-Hakim; Maarifat Ma Yajib Li Aal Al-Bait Al-Nabawi Min Al-Haqq Alaa Men Adahum, p. 73; Yanabi^ Al-Mawadda, v. 2, ch. 59, p. 468. 24) The Prophet (s) said, "Fatima is the head of the women of Paradise." Sahih Al-Bukhari, v. 3, Kitab Al-Fadha'il, Chapter on the Virtues of Fatima, p. 1374; Mustadrak Al-Sahihain, v. 3, Chapter on the Virtues of Fatima, p. 164; Sunan Al-Tirmidhi, v. 3, p. 266; Kenz Al-Omal, v. 13, p. 193; Muntakhab Kenz Al-Omal, v. 5, p. 97; Al-Jami^ Al-Sagheer, v. 2, no. 564, p. 5760; Seir Alam Al-Nubala', v. 2, p. 123; Al-Sawaiq Al-Muhariqa, p. 187 & 191; Khasai's Al-Imam Ali of Nisa'i, p. 118; Yanabi^ Al-Mawadda, v. 2, p. 79; Al-Jawhera Fi Nasab Ali Wa Aalihi, p. 17; Al-Bidaya wa Al-Nihaya, v. 2, p. 60. 25) The Prophet (s) said, "Fatima is part of me, so whoever makes her angry makes me angry." Sahih Al-Bukhari, v. 3, Kitab Al-Fadha'il, Chapter on the Virtues of Fatima, p. 1374; Khasa'is Al-Imam Ali of Al-Nisa'i, p. 122; Al-Jami^ Al-Sagheer, v. 2, p. 653, n. 5858; Kenz Al-Omal, v. 3, pp. 93-97; Muntakhab in the margin of Al-Musnad, v. 5, p. 96; Masabih Al-Sunnah, v. 4, p. 185; Is^af Al-Raghibeen, p. 188; Dakha'ir Al-Uqubi, p. 37; Yanabi^ Al-Mawadda, v. 2, pp. 52-79. 26) The Prophet (s) said, "Fatima is a maiden of Paradise created in human form." Manaqib Al-Imam Ali of Ibn Al-Maghazali, p. 296. 27) The Prophet (s) said, "Fatima is a maiden of Paradise in human form, she does not receive any kind of menses." 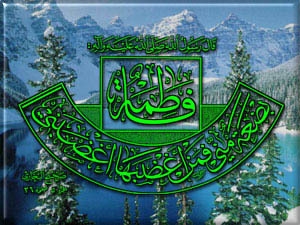 Al-Sawaiq Al-Muhariqa, p. 160; Is^af Al-Raghibeen, p. 188; Kenz Al-Omal, v. 13, p. 94; Muntakhab Kenz Al-Omal, v. 5, p. 97. 28) The Prophet (s) said, "Fatima is part of me, whatever harms her harms me, and whatever is against her is against me." Mustadrak Al-Sahihain, v. 3, p. 173; Sunan Al-Tirmidhi, v. 3, Chapter on the Virtues of Fatima, p. 240; Kenz Al-Omal, v. 13, p. 94; Muntakhab Kenz Al-Omal, in the margin of Al-Musnad, v. 5, p. 96; Al-Sawaiq Al-Muhariqa, ch. 3, p. 190. 29) The Prophet (s) said, "Fatima is part of me - whatever makes her angry makes me angry, and whatever pleases her pleases me." Al-Sawaiq Al-Muhariqa, p. 188; similar wording is narrated in Mustadrak Al-Sahihain, v. 3, p. 172; Al-Jami^ Al-Sagheer, v. 2, p. 653, n. 5859. 30) The Prophet (s) said, "Fatima is more beloved to me than you, oh Ali, and you are dearer to me than her." Majma^ Al-Zawa'id, v. 9, p. 202; Al-Jami^ Al-Sagheer, v. 2, p. 654, n. 5761; Muntakhab Kenz Al-Omal, v. 5, 97; Asad Al-Ghaba, v. 5, p. 522; Yanabi^ Al-Mawadda, v. 2, ch. 56, p. 79; Al-Sawaiq Al-Muhariqa, ch. 3, p. 191. 31) The Prophet (s) said, "Fatima is part of me and she is my heart and the soul which is between my two sides." 32) The Prophet (s) said, "Fatima is the head of the women of my nation." Seir Alam Al-Nubala', v. 2, p. 127; Sahih Muslim, Kitab Fadha'il Al-Sahaba, Chapter on the Virtues of Fatima; Majma^ Al-Zawa'id, v. 2, p. 201; Is^af Al-Raghibeen, p. 187. 33) The Prophet (s) said, "Fatima is a branch of me, what pleases her pleases me, and what saddens her, saddens me." Mustadrak Al-Sahihain, v. 3, Chapter on the Virtues of Fatima, p. 168; Kenz Al-Omal, v. 13, p. 96; Muntakhab Kenz Al-Omal, v. 5, p. 97; Seir Alaam Al-Nubala', v. 2, p. 132. 34) The Prophet (s) said, "Fatima is part of me - whatever causes her pain causes me pain, and whatever makes her happy makes me happy." 35) The Prophet (s) said, "Fatima is part of me, whoever harms her has harmed me." Al-Sunan Al-Kubra, v. 10, chapter regarding the one who denies the testimony of the father for his child, p. 201; Kenz Al-Omal, v. 13, p. 96; Nur Al-Absar, p. 52; Yanabi^ Al-Mawadda, v. 2, p. 322. 36) The Prophet (s) said, "Fatima is the joy of my heart, and her sons are the fruit of my soul." Yanabi^ Al-Mawadda, v. 1, ch. 15, p. 243. 37) The Prophet (s) said, "Fatima is not like the women of the children of Adam." Majma^ Al-Zawa'id, v. 9, p. 202. 38) The Prophet (s) said, "Fatima is part of me - what saddens her saddens me, and what pleases her pleases me." Al-Sunan Al-Kubra, v. 7, p. 64, the chapter on what will transpire on the Day of Judgement; Muntakhab Kenz Al-Omal, in the margins of Al-Musnad, v. 5, p. 96. 39) The Prophet (s) said, "Oh Fatima, verily God is angry when you are angry." Al-Sawaiq Al-Muhariqa, p. 175; Mustadrak Al-Hakim, Chapter on the Virtues of Fatima; Manaqib Al-Imam Ali of Ibn Al-Maghazali, p. 351. 40) The Prophet (s) said, "Fatima, God will not torture you or any of your children." Kenz Al-Omal, v. 13, p. 96; Muntakhab Kenz Al-Omal, in the margin of Musnad Ahmad, v. 5, p. 97; Is^af Al-Raghibeen, in the margin of Nur Al-Absar, p. 118.